Det. Sgt. Hank Idsinga said releasing the photo was a "last resort" to identify the man. 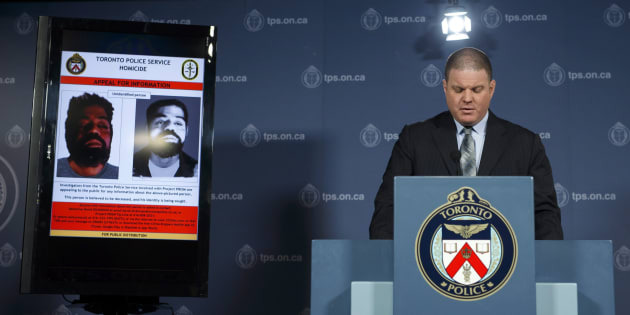 Detective Sergeant Hank Idsinga speaks to media regarding an unidentified male believed to be connected to the Bruce McArthur case, during a press conference at the Toronto Police Headquarters on April 11, 2018. A man believed to be another victim of alleged serial killer Bruce McArthur has been identified after investigators released his photograph and appealed to the public for help, police said Friday. McArthur, a 66-year-old self-employed landscaper, currently faces seven counts of first-degree murder in connection with men who had ties to the city's LGBTQ community. Det. Sgt. Hank Idsinga said at the time that releasing the headshot was a "last resort.'' Investigators did not say when the photograph was taken or how investigators found it. Earlier this week, Idsinga released a new version of the photograph, enhanced by a member of the public, saying police had received hundreds of tips, but had yet to identify the man in the image. On Friday, police said they had been able to identify the man. They said they would not release the man's name or details on whether new charges will be laid against McArthur until the man's next of kin were notified. McArthur was arrested in January and charged with the murders of Andrew Kinsman and Selim Esen, who went missing from Toronto's gay village in 2017. Later that month, McArthur was charged with the murders of Majeed Kayhan, Soroush Mahmudi, and Dean Lisowick. In February, he was charged in the death of Skandaraj Navaratnam. On Wednesday, McArthur was charged in the death of 42-year-old Abdulbasir Faizi, who disappeared from the gay village in 2010. At least seven sets of remains, including Faizi's, have been recovered from planters located at a Toronto home where McArthur once worked as a landscaper, police have said. There is no current evidence linking McArthur to the cold cases but they fit the general profile of the alleged victims identified to date, Idsinga has said. Police say they plan to investigate at least 70 more properties where McArthur is believed to have worked, and also remain on the scene of McArthur's east-Toronto apartment.